This week marks 3 months since we took ownership of our property (and 6 months since we last visited it.) In that time we’ve spent hundreds of hours researching and discussing our different ideas for the property and bus. Yet only around 45 minutes actually on site! Thankfully we had a friend visiting Tassie in August who popped in and took some photos for us (thanks Franny and Kenny!). As you can imagine it’s presented a number of issues when it comes to design (there’s been a few heated discussion.) We both have differing views on where North is in relation to the bus and house pad. One thing that is set (we think because we can’t quite remember and haven’t actually measured) is the size of the bus (10.5 metres by 2.5 metres)! With that certainty we have set about designing our bus conversion. Below are a couple of designs that we have worked through. Our first seeds of this design began in a pizza restaurant in Derby. Waiting for our dinner we both drew our own version of the converted bus. 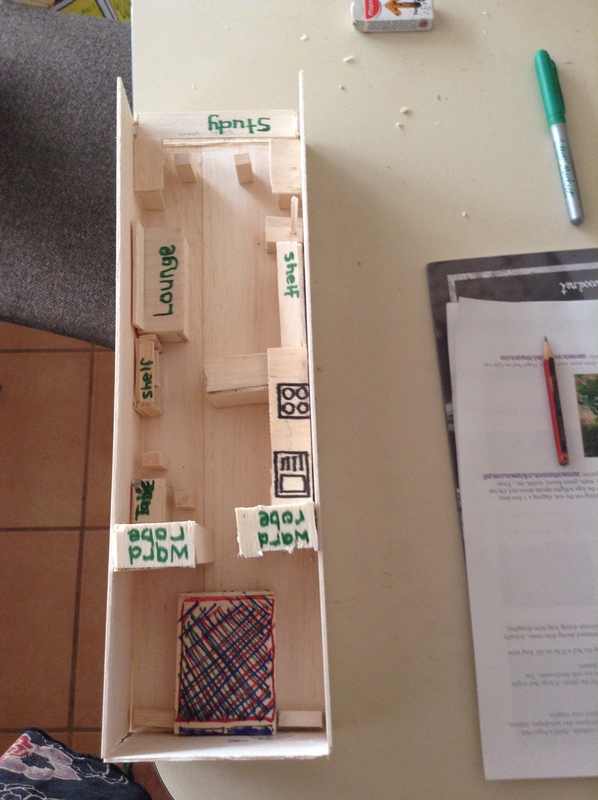 From there we settled on a combined design that became the basis for the balsa wood model we built below. In this design the bedroom is at the back of the bus with a couple of wardrobes acting as a hallway leading into/from the kitchen. 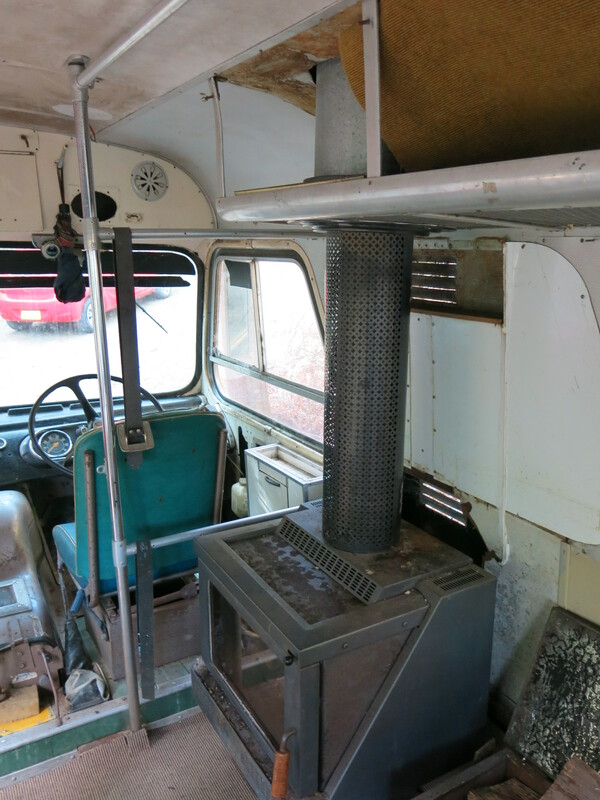 The bus is then an open space consisting of a kitchen/dining area and lounge room centered around the wood fired heater. The front of the bus is a study with desk all around and the driver and passenger seats repurposed as chairs. After knocking the model over countless times and having to rearrange the furniture a few too many times we decided a more portable model was better. With this in mind we downloaded Sketchup and spent a few days learning how to create the 3D model below. Whilst we are happy with the 2nd design it’s by no means the finished and final design. For starters we are not sure exactly where the back wheel hubs are. The design is for the wardrobe/kitchen cupboard to sit over the top of them (concealing what would be too hard to take out). Our measurements for the bedroom are based on what we think would work best not on any onsite measurements (who needs a measuring type when you’ve got a dream!) so until there we won’t be certain. We are also not sure where to put the kitchen stove and sink. On the passenger side (same side as the door) would make it easier to connect the gas. It would also save clearing the silver wattle and bracken on the drivers side of the bus. 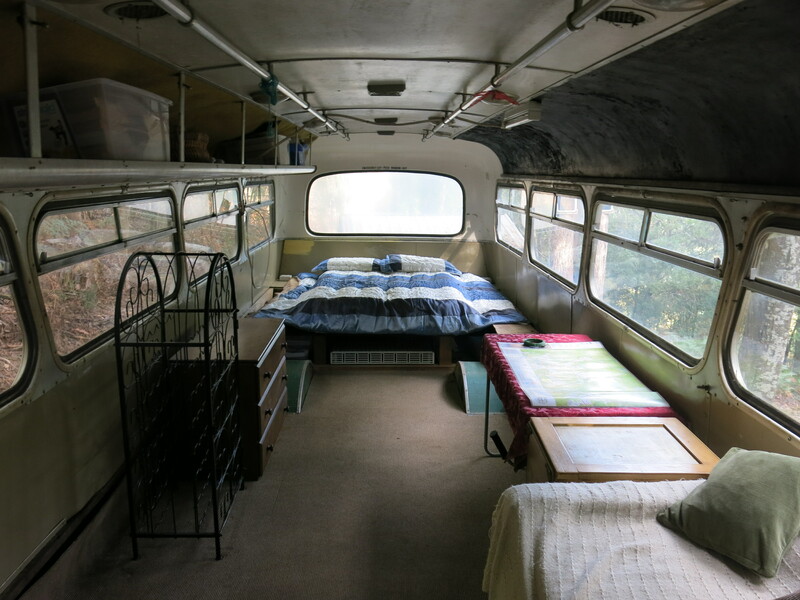 But, we want to have a zone 1 kitchen garden come cooking area (with rocket stove and pizza oven) on the drivers side of the bus. So this area needs clearing anyway. And it’s always nice to look out over a vegie bed when washing dishes. Then there’s the question of shelving and storage. How much stuff are we taking? How much storage do we need? How much storage is already there? Again until we are on site we won’t know. And that’s just a start. There’s the grey water system and plumbing and gas for the bus. There’s the lights: what type of LED; how many LED lights; how many power points and where to put them. Plenty to keep us busy over the next 8 weeks, tweaking and altering our dream.